Spring is sailing into port after a long winter festooned in periwinkle finery. It’s hard to believe that winter is behind us, but believing takes practice. Make no mistake; the seas in spring are quite treacherous. The only way to cope with something deadly serious is to try to treat it a little lightly. What better way to do that than with this new hue? Obtain one of these Gold Boxes and it may sprout Periwinkle Parrots, Toucans, Tigers, and Unicorns. Sure, ye may not have seen these colors in the wild yet, but ye don’t have to understand things for them to be. 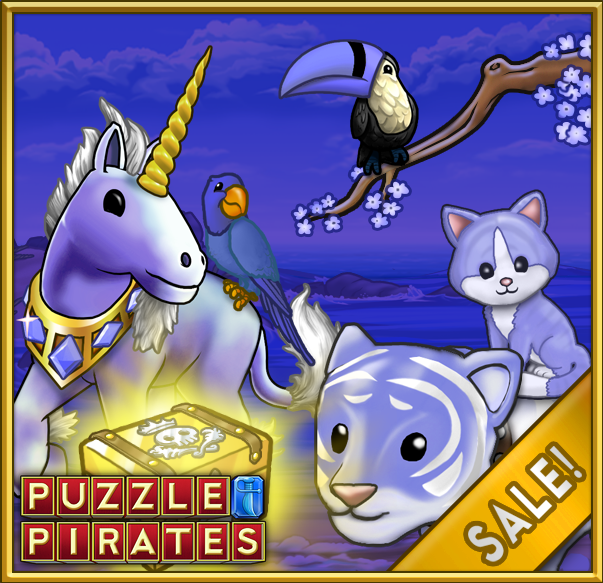 Find Gold Boxes at yer island bank until April 15th at 3 PM PDT. Get the full list o' goods right here. Don’t wait. Just like the first bulbs of spring, this box won't be around long!